1) Conformation Lameness – may be genetic or acquired through accident. 2) Pathological lameness – may be through a knock, a fall, overexertion, repetitive strain, over exercise, or a mishap in day to day life, this can result in inflammation, swelling, scar tissue, muscular adhesions, knots, tears and strains. Lameness is usually down to pain. Complementary Lameness – Weight is redistributed from one painful leg to another, typically this occurs asymmetrically although some dogs will refer laterally depending on the injury. This means that lameness seen in one leg may actually be secondary overcompensation so therefore the leg you are seeing the lameness on is not necessarily the leg of primary concern. This makes it important that a massage therapist addresses the whole body not just the area of primary concern. Weight Bearing Lameness – lameness is caused by the dog not putting weight on the leg rather than by movement. This is commonly indicative of issues such as Cruciate Ligament Sprain or Osteochondrosis Dessicans, it can also sometimes occur with a Grade 2 Muscle Strain; this can happen when the dog is moving or playing, suddenly yelps out, goes still and lame and the owner may also seem temporary Three Legged Lameness. If it is muscular the dog should return to weight-bearing within 24/48 hours but will still be in pain as the Strain Repairs over the forthcoming weeks. Three Legged Lameness – the dog may hold a leg off the ground on the stand or on the move. This could be a sign of a sudden rupture to a ligament. If it is muscular the dog should return to normal weight bearing with minutes, hours or a day. 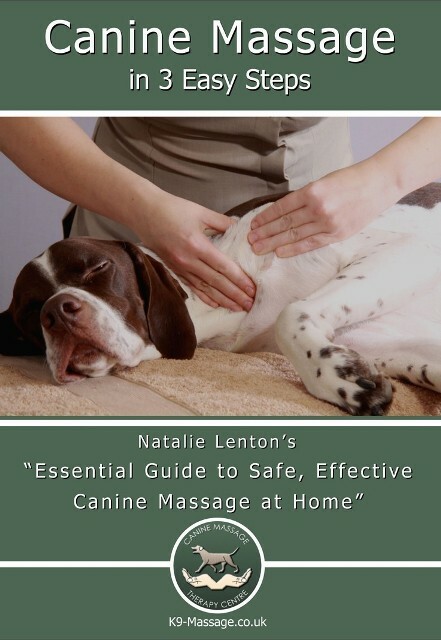 A responsible Canine Massage Therapist should work with your vet to ensure that your dog has no contraindications and this should involve the owner going to their vet with the therapists consent form. Its the therapists job to understand the medical history of the dog so they can ensure that massage therapy is suitable. A good therapist will have a thorough understanding of orthopaedic and neurological conditions so they can fully assess your dog and importantly recommend to the owner when the dog needs to be referred back to the vet for further investigations. Massage can often bring a complete resolution of lameness when it is muscular and can significantly help arthritic dogs by addressing areas of Protective Muscle Splinting.